Stainless steels (SS) are alloys of iron (Fe) which containing a minimum of 10.5 % chromium (Cr). With increasing content of Cr and with the presence or absence of many of other elements, SS can provide an extraordinary range of corrosion resistance. Different grades of SS are being used since several years in atmospheres which are mild (open air, in architectural applications) as well as extremely severe (chemical-processing industries). Stainless steels are classified in five families as per the crystal structures and the strengthening precipitates. Each family of SS shows its own general features in terms of mechanical properties and corrosion resistance. Within each family, there is a range of specifications which varies in composition, corrosion resistance, and cost. Stainless steels are vulnerable to several types of localized corrosive attack. The avoidance of such localized corrosion is the focus of most of the efforts made in the selection of SS. Also, the corrosion performance of SS is strongly influenced by practices of design, fabrication, surface conditioning, and maintenance. The selection of a grade of SS for a specific application involves the consideration of several factors, but the main factor remains corrosion resistance. It is the first necessity to specify the likely service environment. Besides considering the design conditions, it is also necessary to consider the reasonably anticipated exposures or upsets in service conditions. The suitability of a specific specification can be assessed from laboratory tests or from the documented field experience in similar atmospheres. Once the specification with satisfactory corrosion resistance has been identified, it is then appropriate to consider other factors such as mechanical properties, ease of fabrication, the types and degree of risk present in the application, the availability of the necessary product forms, and cost. There are five major families of SS as per the crystallographic structures and the strengthening precipitates (Fig 1). Each family is different with regard to its mechanical properties. Also, each family tends to share a common nature in terms of resistance/vulnerability to particular types of corrosion. However, within each family, it is possible to have a substantial range of compositions. Therefore, each family is applicable to a broad range of corrosive atmospheres. Ferritic stainless steels – It is the simplest type of SS containing only Fe and Cr. Chromium is a ferrite stabilizer and hence the stability of the ferritic structure increases with the content of Cr. Ferrite has a body-centered cubic (bcc) crystal structure, and it is characterized as magnetic and relatively high in yield strength (YS) but low in ductility and work hardenability. Ferrite shows an extremely low solubility for such interstitial elements as carbon (C) and nitrogen (N2). The ferritic SS grades show a transition from ductile to brittle behaviour over a relatively narrow temperature range. At higher C and N2 contents, particularly at higher Cr levels, this ductile-to-brittle transition can occur above ambient temperature. This likelihood severely limited the use of ferritic grades before the arrival of argon oxygen decarburization (AOD) process. The ferritic family of SS was then limited to a few grades for such corrosion applications as automotive trim. The fact that ferritic SS are readily sensitized to inter-granular corrosion as a result of welding or thermal exposure further limited their use. With AOD process, it became possible to reduce the levels of C and N2 substantially. The activity of C and N2 could further be reduced with the use of stabilizers, which are highly reactive elements, such as titanium (Ti) and niobium (Nb) which precipitates the remaining interstitial elements. This newer generation of ferritic SS includes more highly alloyed ferritic grades. With control of interstitial elements, it is possible to produce grades with unusually high Cr and molybdenum (Mo) contents. At the low effective C levels, Ferritic SS are tougher and more weldable than the first generation of ferritic SS grades. However, their limited toughness generally restricts their use to sheet or light gauge tubes. Ferritic SS are highly resistant and are in some cases immune to chloride stress corrosion cracking (SCC). These steels are frequently considered for thermal transfer applications. The same properties and advantages are also responsible for the extraordinary development of the lowest alloyed grade of the ferritic SS. This grade, developed for automotive muffler and catalytic converter service, has gained in technical sophistication. It is increasingly being used in automotive exhaust systems and in other moderately severe atmospheric exposure applications. Austenitic stainless steels – The detrimental effects of C and N2 in ferrite can be overcome by changing the crystal structure to austenite, a face-centered cubic (fcc) crystal structure. The change in crystal structure is done by adding austenite stabilizers usually nickel (Ni) but also sometimes N2 and manganese (Mn). Austenite is nonmagnetic in behaviour, and it is usually relatively low in YS with high ductility, rapid work-hardening rates, and excellent toughness. These desired mechanical properties, combined with ease of fabrication, have made the austenitic steels as the most common SS used. Processing difficulties tend to limit the increase in Cr content. Hence, improved corrosion resistance is normally obtained by adding Mo. The use of N2 as an intentional addition stabilizes the austenite phase, particularly with regard to the precipitation of intermetallic compounds. With the N2 addition, it is possible to produce austenitic grades with up to 6 % Mo for improved corrosion resistance in chloride atmospheres. Other special specifications of austenitic SS include the high Cr grades for high temperature service and the high Ni grades for inorganic acid atmospheres. The austenitic SS can be sensitized to inter-granular corrosion by welding or by longer term thermal exposure. These thermal exposures lead to the precipitation of Cr carbides in grain boundaries and to the depletion of Cr adjacent to these carbides. Sensitization can be greatly delayed or prevented by the use of lower C grades (less than 0.03 % C) or stabilized grades which include additions of carbide stabilizing elements (Ti and Nb). The common austenitic SS are especially vulnerable to chloride SCC. All austenitic SS show some degree of susceptibility, but several of the high Ni high Mo grades are satisfactory with respect to stress-corrosion attack in many engineering uses. Martensitic stainless steels – With lower Cr levels and relatively high C levels, it is possible to get austenite at higher temperatures and then, with accelerated cooling, to transform this austenite to martensite, which has a body centered tetragonal (bct) structure. Just as with plain C and low alloy steels, this strong, brittle martensite can be tempered to favourable combinations of high strength and adequate toughness. Because of the ferrite stabilizing character of Cr, the total Cr content, and thus the corrosion resistance, of the martensitic grades is rather lower. These days, N2, Ni, and Mo additions at somewhat lower C levels are being done to produce martensitic SS of improved toughness and corrosion resistance. Duplex stainless steels – These SS can be thought of as Cr-Mo ferritic SS to which adequate austenite stabilizers have been added to produce SS with a balance presence of ferrite and austenite at room temperature. These grades of SS have the high Cr and Mo responsible for the good corrosion resistance of ferritic SS as well as the favourable mechanical properties of austenitic SS. In fact, the duplex SS with about equal amounts of ferrite and austenite have good toughness and their strength exceeds either phase present alone. First generation SS attained this phase balance mainly by Ni additions. These early duplex SS have superior properties in the annealed condition, but segregation of Cr and Mo between the two phases as re-formed after welding often significantly reduced their corrosion resistance. The addition of N2 to the second generation of duplex SS restored the phase balance more rapidly and minimized Cr and Mo segregation without annealing. The newer duplex SS combines high strength, good toughness, high corrosion resistance, good resistance to chloride SCC, and good production economy in the heavier product forms. 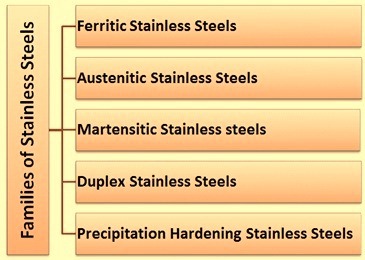 Precipitation-hardening stainless steels – These steels are Cr-Ni grades which can be hardened by an aging treatment at a moderately high temperature. These SS grades can have austenitic, semi-austenitic, or martensitic crystal structures. Semi-austenitic structures are transformed from a readily formable austenite to martensite by a high temperature austenite-conditioning treatment. Some SS grades use cold work to facilitate transformation. The strengthening effect is achieved by adding such elements as copper (Cu) and aluminum (Al), which form intermetallic precipitates during aging. In the solution-annealed condition, these SS grades have properties similar to those of the austenitic grades and are therefore readily formed. Hardening is achieved after fabrication within a relatively short time at 500 deg C to 600 deg C. The precipitation-hardened grades are not to be subjected to further exposure to higher temperature by welding or environment, because the strengthening can be lost by over-aging of the precipitates. The precipitation-hardened SS grades have corrosion resistance generally comparable to that of the Cr-Ni grades. The mechanism of corrosion protection in SS steels differs from that for C steels, and alloy steels, and most other metals. In these other cases, the formation of a barrier of true oxide separates the metal from the surrounding atmosphere. The degree of protection afforded by such an oxide is a function of the thickness of the oxide layer, its continuity, its coherence and adhesion to the metal, and the diffusivities of oxygen (O2) and metal in the oxide. In high temperature oxidation, SS use a generally similar model for corrosion protection. However, at lower temperatures, SS do not form a layer of true oxide. Instead, a passive film is formed. One mechanism that has been suggested is the formation of a film of hydrated oxide, but there is not total agreement on the nature of the oxide complex on the steel surface. However, the oxide film is to be continuous, nonporous, insoluble, and self-healing if broken in the presence of O2. Passivity exists under certain conditions for particular atmospheres. The range of conditions over which passivity is maintained depends on the precise atmosphere and on the family and composition of the SS. When conditions are favourable for maintaining passivity, SS show exceptionally low corrosion rates. If passivity is destroyed under conditions that do not permit restoration of the passive film, then SS corrode like a C or low alloy steel. The presence of O2 is essential to the corrosion resistance of a SS. The corrosion resistance of SS is at its maximum when the steel is boldly exposed and the surface is maintained free of deposits by a flowing bulk atmosphere. Covering a portion of the surface (such as by bio-fouling, painting, or installing a gasket etc.) produces an O2 depleted region under the covered portion. The O2 depleted region is anodic relative to the well-aerated boldly exposed surface, and a higher level of alloy content is needed in the SS to prevent corrosion. With suitable selection of SS, SS can perform for very long periods with minimal corrosion, but an insufficient grade can corrode and perforate more rapidly than plain C steel will fail by uniform corrosion. Selection of the suitable grade of SS is then a balancing of the desire to minimize cost and the risk of corrosion damage by exposures of atmospheric conditions during operation or downtime. There is some confusion regarding the meaning of the term passivation. It is not necessary to chemically treat a SS to obtain the passive film. The film forms spontaneously in the presence of O2. Most frequently, the function of passivation is to remove free Fe, oxides, and other surface contamination. As an example, in the cold rolling mill, SS may be pickled in an acid solution, often a mixture of nitric (HNO3) and hydrofluoric (HF) acids, to remove oxides formed in heat treatment. Once the surface is cleaned and the bulk composition of the SS is exposed to air, the passive film forms immediately. Chromium is the only element which is necessary for the formation of the passive film in SS. Other elements can influence the effectiveness of Cr in forming or maintaining the film. The film is first seen at around 10.5 % Cr, but it is somewhat weak at this composition and provides only mild atmospheric protection. Increase of Cr content in the range of 17 % to 20 % (austenitic SS), or in the range of 26 % to 29 % (the newer ferritic SS) greatly increases the stability of the passive film. However, higher Cr adversely affects mechanical properties, fabricability, weldability, or suitability for uses involving certain thermal exposures. Hence, it is often more efficient to improve corrosion resistance by altering other elements, with or without some increase in Cr. Nickel, in adequate quantities, stabilizes the austenitic structure. This greatly improves mechanical properties and fabrication characteristics. Ni is effective in promoting re-passivation, mainly in reducing atmospheres. Ni is mostly useful in resisting corrosion in mineral acids. Increasing Ni content to around 8 % to 10 % reduces resistance to SCC, but further increases start restoring SCC resistance. Resistance to SCC in many of the atmospheres is achieved at around 30 % Ni. In the water ferritic grades, in which the Ni addition is less than that required to destabilize the ferritic phase, there are still considerable effects. In this range, Ni increases YS, toughness, and resistance to reducing acids, but it makes the ferritic grades susceptible to SCC in concentrated magnesium chloride (MgCl2) solutions. Manganese in moderate quantities and in association with Ni additions performs many of the functions attributed to Ni. However, complete replacement of Ni by Mn is not practical. SS with very high levels of Mn have some unusual and useful mechanical properties, such as resistance to galling. Mn interacts with sulphur (S) in SS steels to form Mn sulfides. The morphology and composition of these sulphides have substantial effects on corrosion resistance, particularly pitting resistance. Molybdenum in combination with Cr is very effective in terms of stabilizing the passive film in the presence of chlorides. Mo is mainly effective in increasing resistance to the initiation of pitting and crevice corrosion. Carbon is useful to the extent that it permits hardenability by heat treatment, which is the basis of the martensitic grades. It is also useful since it provides strength in the high temperature uses of SS. In all other uses, C is harmful to corrosion resistance through its reaction with Cr. In the ferritic grades, C is also extremely harmful to toughness. Nitrogen is beneficial to austenitic SS steels in that it improves pitting resistance, retards the formation of the Cr-Mo sigma phase, and strengthens the steel. N2 is necessary in the newer duplex grades for increasing the austenite content, reducing Cr and Mo segregation, and raising the corrosion resistance of the austenitic phase. N2 is very harmful to the mechanical properties of the ferritic grades and is to be treated as comparable to C when a stabilizing element is added to SS. Corrosion failures in SS can frequently be prevented by suitable changes in design or process parameters and by use of the proper fabrication technique or treatment. The solution to a corrosion problem is not always to upgrade the SS. It is of course very important to establish the types of corrosion which can occur in a given service atmosphere, and if failure does occur, it is important to establish the type of corrosion which caused the failure in order that the proper preventive measures can be implemented. Heat treatment is important. Improper heat treatment can produce harmful changes in the microstructure of SS. The most troublesome problems are carbide precipitation (sensitization) and precipitation of various intermetallic phases. Sensitization, or carbide precipitation at grain boundaries, occurs when austenitic SS are heated for a period of time in the range of about 430 deg C to 870 deg C. Time at temperature controls the amount of carbide precipitation. When Cr carbides precipitate in grain boundaries, the area immediately adjacent is depleted of Cr. When the precipitation is relatively continuous, the depletion renders the SS susceptible to inter-granular corrosion, which is the dissolution of the low Cr layer or envelope surrounding each grain. Sensitization also lowers resistance to other forms of corrosion, such as pitting, crevice corrosion, and SCC. Time-temperature-sensitization curves are available that provide guidance for avoiding sensitization and illustrate the effect of C on this phenomenon. These curves are general guidelines and need to be verified before they are applied to different types of SS. Another method of avoiding sensitization is to use stabilized SS. Such SS steels contain Ti and/or Nb. These elements have an affinity for C and form carbides readily. This allows Cr to remain in solution even for extremely long exposures to temperatures in the sensitizing range. Annealing is the only way to correct sensitized SS. Sigma phase precipitation and precipitation of other intermetallic phases also increase susceptibility of SS to corrosion. Sigma phase is a Cr-Mo rich phase which can render SS susceptible to inter-granular corrosion, pitting, and crevice corrosion. It generally occurs in high alloyed SS (high Cr high Mo SS). Sigma phase can occur at a temperature range of 550 deg C to 900 deg C. Like sensitization, it can be corrected by solution annealing. Any heat treatment of SS is normally preceded and followed by cleaning. SS is to be cleaned before heat treating to remove any foreign material that may be incorporated into the surface during the high temperature exposure. Carbonaceous materials on the surface can result in an increase in the C level on the surface, causing carbide precipitation. Salts can cause excessive inter-granular oxidation. Hence, SS is to be cleaned before it is heat treated. After heat treatment, unless an inert atmosphere was used during the process, SS surface is covered with an oxide film. Such films are not very corrosion resistant and are to be removed to allow the SS to form its passive film and provide the corrosion resistance for which it was designed. There are several cleaning methods which can be used before and after heat treatment. The main problems faced in welding of SS are the same as those faced during the heat treatment. The heat of welding (portions of the base metal adjacent to the weld can be heated to 450 deg C to 850 deg C) can cause sensitization and formation of intermetallic phases, thus increasing the susceptibility of SS weldments to inter-granular corrosion, pitting, crevice corrosion, and SCC. These phenomena often occur in the heat affected zone (HAZ) of the weld. Sensitization and intermetallic phase precipitation can be corrected by solution annealing after welding. Alternatively, low C or stabilized grades can be used. Another problem in high heat input welds is grain growth, mostly in ferritic SS. Excessive grain growth can increase susceptibility to inter-granular attack and reduce toughness. Thus, when welding SS, it is advisable to limit weld heat input as much as possible. Before any welding begins, all materials, chill bars, clamps, hold down bars, work tables, electrodes, and wire, as well as the SS, are to be cleaned of all foreign materials. Moisture can cause porosity in the weld which reduces its corrosion resistance. Organic materials, such as grease, paint, and oils, can result in carbide precipitation. Cu contamination can cause cracking. Weld design and procedure are important in producing a sound corrosion resistant weld. Good fit and minimal out-of-position welding minimize crevices and slag entrapment. The design is not to place welds in critical flow areas. When attaching such devices as low alloy steel support and ladders on the outside of a SS tank, a SS intermediate pad needs to be used. In general, SS with high alloy content is to be welded with weld metal richer in Cr, Ni, and Mo than the base metal. Every attempt is to be made to minimize weld spatter. After welding, all weld spatter, slag, and oxides are to be removed by brushing, blasting, grinding, or chipping. All finishing equipment is to be free of Fe contamination. It is advisable to follow the mechanical cleaning and finishing with a chemical cleaning. Such a cleaning removes any foreign particles that may have been embedded in the surface during mechanical cleaning without attacking the weldment. For ensuring satisfactory service life, the surface condition of SS is to be given careful attention. Smooth surfaces, as well as freedom from surface defects, traces of scale and other foreign material, reduce the likelihood of corrosion. In general, a smooth, highly polished, reflective surface has greater resistance to corrosion. Rough surfaces are more likely to catch dust, salts, and moisture, which tend to initiate localized corrosive attack. Oil and grease can be removed by using hydrocarbon solvents or alkaline cleaners, but these cleaners are to be removed before heat treatment. Hydrochloric (HCl) acid formed from residual amounts of trichloroethylene, which is used for degreasing, causes severe attack on SS. Surface contamination can be caused by machining, shearing, and drawing operations. Small particles of metal from tools become embedded in the steel surface and, unless removed, can cause localized galvanic corrosion. These particles are best removed by the passivation treatments. Shot blasting or sand blasting is to be avoided unless Fe free silica (SiO2) is used. Metal shot, in particular, contaminates SS surface. If shot blasting or shot peening with metal grit is unavoidable, the parts are to be cleaned after blasting or peening by immersing them in HNO3 acid solution. During handling and processing operations, such as machining, forming, tumbling, and lapping, particles of iron, tool steel, or shop dirt can be embedded in or smeared on the surfaces of SS parts. These contaminants can reduce the effectiveness of the natural oxide (passive) film that forms on SS exposed to O2 at low temperatures. If allowed to remain, these particles can corrode and produce rust like spots on the SS. To prevent this condition, semi-finished or finished parts are given a passivation treatment. This treatment consists of cleaning and then immersing SS parts in a solution of HNO3 acid or of HNO3 acid plus oxidizing salts. The treatment dissolves the embedded or smeared iron, restores the original corrosion resistant surface, and maximizes the inherent corrosion resistance of the SS. Each work piece to be passivated needs to be cleaned thoroughly to remove grease, coolant, or other shop debris. The grease reacts with the HNO3 acid to form gas bubbles, which collect on the surface of the work piece and interfere with passivation. Also, contamination of the passivating solution (particularly with high levels of chlorides) can cause flash attack, which results in a gray or black appearance and deterioration of the surface. To avoid such problems, each part is to be wiped clean of any large machining chips or other debris. More firm deposits are to be removed by brushing with a SS wire brush, grinding, polishing with an iron free abrasive, or sand blasting. Tools and materials used for these processes are to be clean and used only for SS. Machining, forming, or grinding oils are to be removed in order for passivation to be effective. Cleaning is to begin with solvent cleaning, which may be followed by alkaline soak cleaning and thorough water rinsing. Optimum results are obtained in passivation when the parts to be treated are as clean as they would have to be for plating. After cleaning, the work piece can be immersed in the passivating acid bath. The composition of the acid bath depends on the specification of SS. The procedure recommended for passivating free machining SS is rather different from that used for non-free machining SS grades. This is because sulphides of sulphur (S) bearing free machining SS grades, which are totally or partially removed during passivation, create microscopic discontinuities in the surface of the machined part. Even normally efficient water rinses can leave residual acid trapped in these discontinuities after passivation. This acid can then attack the surface of the part unless it is neutralized or removed. For this reason, a special passivation process, referred to as the alkaline-acid-alkaline treatment, is suggested for free machining SS grades. A proper procedure is to be followed when passivating free machining SS grades with the alkaline-acid-alkaline treatment. Testing is often performed to evaluate the passivated surface. As an example, precipitation-hardening, and free machining SS grades are often tested in a cabinet capable of maintaining 100 % humidity at 35 deg C for 24 hours. SS material which is properly passivated is generally free of scale, although light staining can occur. Austenitic SS grades can be evaluated using a test which consists of swabbing the part with a Cu sulphate (CuSO4·5H2O)/sulphuric (H2SO4) acid solution. The wetness is to be maintained for 6 min. Free Fe, if present, plates out the Cu from the solution, and the surface develops a Cu colour. Corrosion can often be avoided by suitable changes in design without changing the type of steel. The factors to be considered include joint design, surface continuity, and concentration of stress. Designs which have a tendency to concentrate corrosive media in a small area are to be avoided. As an example, tank inlets are to be designed such that concentrated solutions are mixed and diluted as they are introduced. Otherwise, localized pockets of concentrated solutions can cause excessive corrosion. Poor design of heaters can create similar problems, such as those that cause hot spots and thus accelerate corrosion. Heaters are to be centrally located. If a tank is to be heated externally, heaters are to be distributed over as large a surface area as possible, and circulation of the corrosive medium is to be encouraged, if possible. Poor design creates hot spots which can induce boiling under the heater at the bottom of the vessel or can cause deposits to form between heaters and vessel walls. Good design avoids hot spots and pockets in which small volumes of liquid can become trapped between the heater and the vessel wall. Hot gases which are not corrosive to SS can form corrosive condensates on the cold portions of a poorly insulated unit. Proper design or insulation can prevent such localized cooling. Conversely, vapours from non-corrosive liquids can cause attack. Exhausts and overflows need to be designed to prevent hot vapour pockets. In general, the open ends of inlets, outlets, and tubes in heat exchangers need to be flush with tank walls or tube sheets to avoid buildup of harmful corrodents, sludges, and deposits. This is also true of tank bottom and drainage designs. Tanks and tank supports are to be designed to prevent or minimize corrosion due to spills and overflows. A tank support structure may not be as corrosion resistant as the tank itself, but it is a very important part of the unit and is not to be made susceptible to spilled corrodents. Designs which increase turbulence or result in excessive flow rates are to be avoided where erosion-corrosion is a problem. Gaskets in flanges are to fit properly, intrusions in a flow stream are to be avoided, and elbows are to be given a generous radius. Finally, crevices are to be avoided. Where crevices cannot be avoided, they are to be sealed by welding, soldering, or the use of caulking compounds or sealants. The various forms of corrosive attack on SS are described below. General corrosion of SS suggests an atmosphere which is capable of stripping the passive film from the surface and preventing re-passivation. Such an occurrence can indicate an error in grade selection. An example is the exposure of a low Cr ferritic SS to a moderate concentration of hot H2SO4 acid. Galvanic corrosion results when two dissimilar metals are in electrical contact in a corrosive medium. As a highly corrosion resistant metal, SS can act as a cathode when in contact with a less noble metal, such as steel. The corrosion of steel parts (example, steel bolts in a SS steel construction) can be a significant problem. However, the effect can be used in a beneficial way for protecting critical SS components within larger steel construction. In the case of SS connected to a more noble metal, consideration must be given to the active passive condition of the SS. If the SS is passive in the environment, galvanic interaction with a more noble metal is unlikely to produce significant corrosion. If the SS steel is active or only marginally passive, galvanic interaction with a more noble metal probably produces sustained rapid corrosion of the SS without re-passivation. Very important aspect of galvanic interaction for SS is the necessity of selecting fasteners and weldments of adequate corrosion resistance relative to the bulk material, which is likely to have a much larger exposed area. Pitting is localized attack that can produce penetration of SS with almost negligible weight loss to the total structure. Pitting is associated with a local discontinuity of the passive film. It can be a mechanical imperfection, such as an inclusion or surface damage, or it can be a local chemical breakdown of the film. Chloride is the most common agent for initiation of pitting. Once a pit is formed, it becomes a crevice if the local chemical environment is substantially more aggressive than the bulk atmosphere. This explains why very high flow rates over SS surface tend to reduce pitting corrosion since the high flow rate prevents the concentration of corrosive species in the pit. The stability to the passive film with respect to resistance to pitting initiation is controlled mainly by Cr and Mo. Minor alloying elements can also have an important effect by influencing the amount and type of inclusions in the steel that can act as pitting sites. Pitting initiation can also be influenced by surface condition, including the presence of deposits, and by temperature. For a particular atmosphere, a grade of SS can be characterized by a single temperature, or a very narrow range of temperatures, above which pitting initiates and below which pitting does not initiate. It is therefore possible to select a SS grade which is not under pitting attack if the chemical atmosphere and temperature do not exceed the critical levels. If the range of operating conditions can be accurately considered, a meaningful laboratory evaluation is possible. Formation of deposits in service can reduce the pitting temperature. Though chloride is known to be the main agent of pitting attack, it is not possible to establish a single critical chloride limit for each grade of SS. The corrosivity of a particular concentration of chloride solution can be profoundly affected by the presence/absence of various chemical agents which accelerate/inhibit corrosion. Chloride concentration increases where evaporation or deposits occur. Crevice corrosion can be considered a severe form of pitting. Any crevice, whether the results of a metal-to-metal joint, a gasket, fouling, or deposits, tends to restrict O2 access, resulting in attack. In practice, it is extremely difficult to prevent all crevices, but every effort is to be made to do so. Higher Cr and especially higher Mo grades are more resistant to crevice attack. Just as there is a critical pitting temperature for a particular atmosphere, there is also a critical crevice temperature. This temperature is specific to the geometry and nature of the crevice and to the precise corrosion atmosphere for each grade. The critical crevice temperature can be useful in selecting an adequately resistant grade for a particular use. Inter-granular corrosion is a preferential attack at the grain boundaries of SS. It is usually the result of sensitization. This condition occurs when a thermal cycle leads to grain boundary precipitation of a carbide, nitride, or intermetallic phase without providing sufficient time for Cr diffusion to fill the locally depleted region. A grain boundary precipitate is not the point of attack. Instead, the low Cr region adjacent to the precipitate is susceptible. Sensitization is not necessarily harmful unless the grade is to be used in an atmosphere capable of attacking the region. As an example, high temperature uses for SS can operate with sensitized steel, but concern for inter-granular attack is to be given to possible corrosion during downtime when condensation might provide a corrosive medium. Since Cr provides corrosion resistance, sensitization also increases the susceptibility of Cr depleted regions to other forms of corrosion, such as pitting, crevice corrosion, and SCC. The thermal exposures required to sensitize SS can be relatively brief, as in welding, or can be very long, as in high temperature service. Stress corrosion cracking is a corrosion mechanism in which the combination of a susceptible alloy, sustained tensile stress, and a particular atmosphere leads to cracking of the steel. SS are mainly susceptible to SCC in chloride atmospheres with temperature and the presence of O2 aggravates chloride SCC of SS. Many ferritic and duplex SS grades are either immune or highly resistant to SCC. All austenitic grades are susceptible to some degree. The highly alloyed austenitic grades are resistant to sodium chloride (NaCl) solutions, but crack readily in MgCl2 solutions. Although some localized pitting or crevice corrosion probably precedes SCC, the amount of pitting or crevice attack can be very small and not detectable. Stress corrosion is difficult to detect while in progress, even when pervasive, and can lead to rapid catastrophic failures of pressurized equipment. It is difficult to alleviate the atmospheric conditions which lead to SCC. The level of chlorides required to produce stress corrosion is very low. In operation, there can be evaporative concentration or a concentration in the surface film on a heat rejecting surface. Temperature is frequently a process parameter, as in the case of a heat exchanger. Tensile stress is one parameter that might be controlled. However, the residual stresses associated with fabrication, welding, or thermal cycling, rather than design stresses, is often responsible for SCC, and even stress-relieving heat treatments do not completely eliminate these residual stresses. Erosion-corrosion is the corrosion of a steel or alloy which can be accelerated when there is an abrasive removal of the protective oxide layer. This form of attack is especially significant when the thickness of the oxide layer is an important factor in determining corrosion resistance. In the case of SS, erosion of the passive film can lead to some acceleration of attack. Oxidation is a cause of corrosion. Because of their high Cr content, SS tend to be very resistant to oxidation. Important factors which are to be considered in the selection of SS for high temperature service are the stability of the composition and microstructure of the grade upon thermal exposure and the adherence of the oxide scale upon thermal cycling. Because many of the SS used for high temperatures are austenitic grades with relatively high Ni content, it is also necessary to be alert to the possibility of sulphidation attack. Selection of a suitable SS grade for a specific atmosphere requires consideration of several criteria. The first is corrosion resistance. SS grades are available that provide resistance to mild atmospheres as well as for many food processing atmospheres. Chemicals and more severe corrodents require a more highly alloyed SS. Factors that affect the corrosivity of an atmosphere include the concentration of chemical agents, pH, aeration, flow rate (velocity), impurities (such as chlorides), and temperature, including effects from heat transfer. The second criterion is mechanical properties, or strength. High strength materials often sacrifice resistance to some form of corrosion, particularly SCC. In the third criterion, fabrication is to be considered, including such factors as the ability of the SS to be machined, welded, or formed. Resistance of the fabricated article to the atmosphere is also to be considered. As an example, the ability of the material to resist attack in crevices cannot be avoided in the design. As per fourth criterion, total cost is to be estimated, including initial price of SS, installed cost, and the effective life expectancy of the finished product. Finally, consideration is to be given to product availability. The atmospheric pollutants mainly responsible for the scaling of SS structures are chlorides and metallic iron dust. Chloride pollution usually originate from the calcium chloride (CaCl2) used to make concrete or from exposure in marine or industrial places. Fe pollution can take place during fabrication or erection of the structure. The corrosivity of different atmospheric exposures varies significantly and can dictate use of different SS grades. Rural atmospheres are very mild in terms of corrosivity for SS, even in areas of high humidity. Industrial or marine atmospheres are much more severe. Though marine atmospheres can be severe, SS often provides good resistance. SS containing Mo shows only very small scale stain, and all grades of SS can be easily cleaned to reveal a bright surface. Though normal austenitic SS can provide satisfactory resistance in many marine applications, but more highly alloyed grades are normally selected when the SS is sheltered from washing by the weather and is not cleaned regularly. SCC is normally not a concern when austenitic or ferritic SS are used in atmospheric exposures. Annealed and quarter hard wrought SS are not susceptible to SCC. In the as welded condition, some types of SS can experience failure. Following sensitization at 650 deg C for 1.5 hours and furnace cooling, failures are possible only for SS with C levels of 0.043 % or more. SCC is required to be considered when quench-hardened martensitic SS or precipitation hardening SS is used in marine atmospheres or in industrial places where chlorides are present. Precipitation hardenable SS grades are expected to show improved corrosion resistance when higher aging temperatures (lower strengths) are used. Resistance to SCC is of specific interest in the selection of high strength SS for fastener applications. Cracking of high strength fasteners is possible and frequently results from hydrogen (H2) generation due to corrosion or contact with a less noble material, such as Al. Resistance to SCC can be improved by optimizing the heat treatment. Fasteners for atmospheric exposure have been fabricated from a wide variety of SS grades. Water qualities can vary from extremely pure to chemically treated water to highly concentrated chloride solutions, such as brackish water or seawater, further concentrated by recycling. This chloride content poses the danger of pitting or crevice attack of SS. When the application involves moderately high temperatures, even as low as 50 deg C, and particularly when there is heat transfer into the chloride containing medium, there is the possibility of SCC. It is useful to consider water with two general levels of chloride content namely (i) freshwater, which can have chloride levels up to around 600 ppm (parts per million), and (ii) seawater, which encompasses brackish and severely contaminated waters. The corrosivity of a certain level of chloride can be strongly affected by the other chemical constituents present, making the water either more or less corrosive. Permanganate ion (MnO4-), which is associated with the dumping of chemicals, has been related to pitting of certain types of SS. The presence of S compounds and O2 or other oxidizing agents do not have very significant effect on SS at ambient or slightly higher temperatures (up to around 250 deg C). In freshwater, austenitic SS provides good service for such items as valve parts, weirs, fasteners, and pump shafts in water and wastewater treatment plants. High strength precipitation hardening SS has been used as shafts for large butterfly valves in potable water. The higher strength of this steel permits reduced shaft diameter and increased flow. Seawater is a very corrosive environment for many materials. SS are more likely to be attacked in low velocity seawater or at crevices resulting from equipment design or attachment of barnacles. Austenitic SS suffer deep pitting if the seawater flow rate decreases below around 1.5 m/s because of the crevices produced by fouling organisms. The choice of SS for seawater service depends on whether or not stagnant conditions can be minimized or eliminated. When seagoing vessels are expected to lie idle for extended periods of time, more resistant SS materials for shafts are considered. Shafts with intermediate corrosion resistance are provided by high N2 type austenitic SS. The most severe exposure conditions are often used in seawater test programs. The possibility of galvanic corrosion is to be considered if SS is to be used in contact with other metals in seawater. Preferably, only those materials that show closely related electrode potentials are to be coupled to avoid attack of the less noble material. Galvanic differences have been used to advantage in the cathodic protection of SS in seawater. Crevice corrosion and pitting of austenitic type SS grades have been prevented by cathodic protection, but some ferritic and martensitic SS grades develop H2 blisters at current densities below those required for complete protection. Other factors which are to be noted when applying SS in seawater include the effects of high velocity, aeration, and temperature. SS generally show good resistance to high velocities, impingement attack, and cavitation in seawater. Also, SS provide optimum service in aerated seawater because a lack of aeration at a specific place often leads to crevice attack. Very little O2 is needed to maintain the passive film on a clean SS surface. Increasing the temperature from ambient to around 50 deg C often reduces attack on SS, possibly because of differences in the amount of dissolved O2, changes in the surface film, or changes in the resistance of the boldly exposed sample area. Further temperature increases can result in increased corrosion, such as SCC. Selection of SS for service in chemical atmospheres needs consideration of all forms of corrosion, along with impurity levels and degree of aeration. When a SS grade with sufficient general corrosion resistance has been selected, care is to be taken to ensure that the material does not fail by pitting or SCC due to chloride contamination. Aeration is an important factor in corrosion, mainly in cases of borderline passivity. If dissimilar-metal contact or stray currents occur, the possibility of galvanic attack or H2 embrittlement is to be considered. Selection of SS also depends on fabrication and operation details. If a material is to be used in the as-welded or stress relieved condition, it must resist inter-granular attack in service after these thermal treatments. In chloride atmospheres, the possibility of crevice corrosion is to be considered when crevices are present because of equipment design or the formation of adherent deposits. Higher flow rates can prevent the formation of deposits, but in extreme cases can also cause accelerated attack due to erosion or cavitation. Higher operating temperatures usually increase corrosion. In heat transfer applications, higher metal wall temperatures result in higher rates than expected from the lower temperature of the bulk solution. There are other items which may require attention in the selection of SS, yet suitable materials continue to be chosen for a wide variety of chemical plant applications. Some generalizations can be made regarding the performance of various types of SS in certain kinds of chemical atmospheres. These observations relate to the compositions of the grades. As an example, the presence of Ni and Cu in some austenitic grades significantly improves resistance to H2SO4 acid compared to the resistance of the ferritic SS grades. However, combinations of chemicals that are encountered in practice can be either more or less corrosive than might be expected from the corrosivity of the individual components. Testing in actual or simulated atmospheres is always recommended as the best procedure for selecting a SS grade. The resistance of stainless steel to mineral acids depends on the H2 ion (H+) concentration and the oxidizing capacity of the acid, along with such material variables as Cr, Ni, and C contents, as well as heat treatment. As an example, annealed SS resists strong HNO3 acid in spite of the low pH of the acid, since HNO3 acid is highly oxidizing and forms a passive film due to the Cr content of the SS. On the other hand, SS are rapidly attacked by strong HCl acid since a passive film is not easily attained. Even in strong HNO3 acid, SS can be rapidly attacked if they contain sufficient C and are sensitized. Oxidizing substances (such a ferric salts) result in reduced general corrosion in some acids, but can cause accelerated pitting attack if chloride ions (Cl-) are present. SS have broad applicability in HNO3 acid mainly because of their Cr content. Most austenitic SS show good resistance in the annealed condition in concentrations from 0 % to 65 % up to the boiling point. More severe atmospheres at higher temperatures require SS with higher Cr. In H2SO4 acid, SS can approach the borderline between activity and passivity. Conventional ferritic grades have limited use in H2SO4 acid but ferritic grades containing higher Cr and Mo (28 % Cr and 4 % Mo) with additions of at least 0.25 % Ni have shown good resistance in boiling 10 % H2SO4 acid, but corrode rapidly when acid concentrations is increased. The conventional austenitic grades show good resistance in very dilute or highly concentrated H2SO4 acid at slightly higher temperatures. Acid of intermediate concentration is more aggressive, and conventional grades have very limited utility. Aeration or the addition of oxidizing materials can considerably reduce the attack of SS in H2SO4 acid. This occurs since the more oxidizing atmosphere is better able to maintain the Cr rich passive oxide film. Improved resistance to H2SO4 acid has been obtained by using austenitic SS grades containing high levels of Ni and Cu. In addition to reducing general corrosion, the increased Ni content provides resistance to SCC. Conventional straight Cr SS have very limited general corrosion resistance in phosphoric (H3PO4) acid and show lower rates only in very dilute or more highly concentrated solutions. Conventional austenitic SS provide useful general corrosion resistance over the full range of concentrations up to around 65 deg C. Use at temperatures up to the boiling point is possible for acid concentrations up to around 40 %. However, in commercial uses wet process H3PO4 acid atmospheres include impurities derived from the phosphate rock, such as chlorides, fluorides, and H2SO4 acid. These three impurities accelerate corrosion, particularly pitting or crevice corrosion in the presence of the halogens. Higher alloyed SS than the conventional austenitic SS are needed to resist wet-process H3PO4 acid. Stainless steels are generally not used for HCl acid, except perhaps for very dilute solutions at room temperature. SS materials can be susceptible to accelerated general corrosion, SCC, and pitting in HCl acid atmospheres. In case of sulfurous (H2SO3) acid, since it is a reducing agent, many SS steels have provided satisfactory service in H2SO3 acid atmospheres. Conventional austenitic SS have been used in sulphite digestors, and several grades of SS have been used in wet sulphur dioxide (SO2) and H2SO3 acid atmospheres. By using cast SS, service life is improved by eliminating crevices, including those from settling of suspended solids, or by using Mo containing grades. In some atmospheres, SCC is also a possibility. Organic acids and compounds are generally less aggressive than mineral acids since they do not ionize as completely, but they can be corrosive to SS, especially when impurities are present. The presence of oxidizing agents in the absence of chlorides can reduce corrosion rates. Resistance of SS to pure acetic acid has been achieved by using austenitic SS over all concentrations up to the boiling point. Impurities present in the manufacture of acetic acid, such as acetaldehyde, formic acid, chlorides, and propionic acid, are expected to increase the attack on SS. Chlorides can cause pitting or SCC. Formic acid is one of the more aggressive organic acids, and corrosion rates can be higher in the condensing vapour than in the liquid. Austenitic SS has been used at moderate temperatures. However, high alloy ferritic SS containing 26 % Cr and 1 % Mo or 29 % Cr and 4 % Mo also show some promise. In case of other organic acids, the corrosivity of propionic and acrylic acids at a given temperature is generally similar to that of acetic acid. Impurities are important and may strongly affect the corrosion rate. In citric and tartaric acids, austenitic SS has been used. Their use can range from moderate temperatures to up to the boiling point for all the concentrations. Most dry organic halides do not attack SS, but the presence of water allows halide acids to form and can cause pitting or SCC. Therefore, care is to be taken when using SS in organic halides to ensure that water is excluded. In case of other organic compounds, austenitic SS are generally satisfactory in aldehydes, in cellulose acetate at lower temperatures, and in fatty acids up to around 150 deg C. Austenitic SS is also used in amines, phthalic anhydride, tar, and urea service. SS is also been used in the plastic and synthetic fiber industries. All SS materials resist general corrosion by all concentrations of sodium hydroxide (NaOH) up to around 65 deg C. Austenitic SS shows low rates of general corrosion in boiling NaOH up to nearly 20 % concentration. SCC of these grades can occur at around 100 deg C. In ammonia (NH3) and ammonium hydroxide (NH4OH), SS shows good resistance at all concentrations up to the boiling point. SS are highly resistant to most neutral or alkaline non halide salts. In some cases, austenitic SS is preferred for its resistance to pitting, but even the higher Mo SS is readily attacked by sodium sulphide (Na2S) solutions. Halogen salts are more corrosive to SS because of the ability of the halide ions to penetrate the passive film and cause pitting. Pitting is promoted in aerated or mildly acidic oxidizing solutions. Chlorides are generally more aggressive than the other halides in their ability to cause pitting. At lower temperatures, most austenitic SS resist chlorine or fluorine gas if the gas is completely dry. The presence of even small amounts of moisture results in accelerated attack, especially pitting and possibly SCC. At high temperatures, SS resist oxidation mainly because of their Cr content. Increased Ni minimizes spalling when temperature cycling occurs. Maximum temperatures for intermittent service are lower for the austenitic SS, but are higher for most of the martensitic and ferritic SS. Contamination of the air with water and CO2 frequently increases corrosion at high temperatures. Increased attack can also occur because of sulphidation as a result of SO2, H2S, or S vapour. Carburization of SS can occur in carbon monoxide (CO), methane (CH4), and other hydrocarbons. Carburization can also occur when SS contaminated with oil or grease is annealed without sufficient O2 to burn off the C. This can occur during vacuum or inert gas annealing as well as open air annealing of oily parts with shapes that restrict air access. Cr, Ni, and silicon (Si) are useful in combating carburization. Austenitic SS are highly resistant to liquid sodium (Na) or sodium-potassium (Na-K) alloys. Mass transfer is not expected up to 550 deg C and remains at moderately low levels up to 850 deg C. Accelerated attack of SS in liquid Na occurs with O2 contamination, with a noticeable effect occurring at around 0.02 % O2. Exposure to liquid lead (Pb) under dynamic conditions often results in mass transfer in common SS systems. Particularly severe corrosion can occur in strongly oxidizing conditions. SS are generally attacked by liquid Al, zinc (Zn), antimony (Sb), bismuth (Bi), cadmium (Cd), and tin (Sn). All the industries feature a variety of uses of SS encompassing a range of corrosion atmospheres. In food and beverage industry, SS have been relied upon because of the lack of corrosion products which can contaminate the process environment and because of the superior cleanability of the SS. The corrosion atmospheres frequently involves moderately to highly concentrated chlorides on the process side, often mixed with significant concentrations of organic acids. The water side can range from steam heating to brine cooling. Purity and sanitation standards require excellent resistance to pitting and crevice corrosion. At high temperatures, SS are to be selected for resistance to pitting and SCC in the presence of chlorides. Stress corrosion is to be avoided in heat transfer applications. Cracking can occur from the process or water side or can initiate outside the unit under chloride containing insulation. In pharmaceutical industry for the production and handling of drugs and other medical applications require exceedingly high standards for preserving the sterility and purity of process streams. Process atmospheres can include complex organic compounds, strong acids, chloride solutions comparable to seawater, and elevated processing temperatures. High alloy SS grades are necessary in order to prevent even superficial corrosion. Electro-polishing may be desirable in order to reduce or prevent adherent deposits and the possibility of under deposit corrosion. Superior cleanability and ease of inspection make SS the preferred material. However, care is required in selecting SS for pharmaceutical uses since small amounts of contamination can be objectionable. In oil and gas industry, SS were not frequently used in oil and gas production until the tapping of sour reservoirs (containing hydrogen sulfide, H2S) and the use of enhanced recovery systems in the mid-1970s. Sour atmospheres can result in sulphide stress cracking (SSC) of susceptible materials. This phenomenon generally occurs at ambient or slightly higher temperatures. Factors affecting SSC resistance include material variables, pH, H2S concentration, total pressure, maximum tensile stress, temperature, and time. The resistance of SS to SSC improves with reduced hardness. In addition to the lower temperature SSC, resistance to cracking in high temperature atmospheres is required in many oil field applications. Many SS including austenitic and duplex grades are known to be susceptible to high temperature cracking, probably by a mechanism similar to chloride SCC. Failure appears to be accelerated by H2S and other S compounds. As an example, increased susceptibility is noted in material of higher yield strength because of the high residual tensile stresses imparted by some cold working operations. Austenitic SS containing N2 have found use in this atmosphere as nonmagnetic drill collars, as weight for the drill bit, and as housings for measurement-while-drilling (MWD) instruments. Nonmagnetic materials are required for operation of these instruments, which are used to locate the drill bit in directional-drilling operations. In refinery applications, the raw crude contains such impurities as S, water, salts, organic acids, and organic N2 compounds. These and other corrosives and their products are to be considered in providing SS steels for the various refinery steps. Duplex and ferritic grades have been used for many applications in refinery for their improved SCC resistance. In case of power industry SS is used for generator components, feed water heaters, boiler applications, heat exchangers, condenser tubings, flue gas desulphurization (FGD) systems, and nuclear power applications. Generator blades and vanes have been fabricated of modified 12 % Cr SS. SS have been widely used in tubing for surface condensers and feed water heaters. Both of these are shell and tube heat exchangers that condense steam from the turbine on the shell side. In these heat exchangers, the severity of the corrosion increases with higher temperatures and pressures. SS resist failure by erosion and do not suffer SCC in NH3 (from decomposition of boiler feed water additives). SS is to be chosen to resist chloride pitting. The amount of chloride that can be tolerated is expected to be higher with higher pH and cleaner SS surfaces. SS can resist pitting in chloride levels of 1000 ppm or higher in the absence of fouling, crevices, or stagnant conditions. The presence of one or more of these conditions can allow chlorides to concentrate at the metal surface and initiate pits. Many high performance SS have been used to resist chloride pitting in brackish water or seawater. High performance austenitic grades have been useful in feed water heaters, although duplex stainless steels can also be considered because of their high strength. Ferritic SS have proved to be economically competitive in exchangers and condensers. High performance austenitic and ferritic grades have been satisfactory for seawater cooled plants. A wide variety of SS have been used in scrubbers, which are located between the boiler and the stack of fossil fuel power plants to treat effluent gases and to remove SO2 and other pollutants. In case of nuclear reactor power plants, SS piping is being used. The operating temperatures of these reactors are around 300 deg C, and a wide range of conditions can be present during startup, operation, and shutdown. Because these pipes are joined by welding, there is a possibility of sensitization. This can result in inter-granular SCC in chloride free high temperature water that contains small amounts of O2. Austenitic SS with additions of around 1 % boron (B) is used to construct spent-fuel storage units, dry storage casks, and transportation casks. The high B level provides neutron-absorbing properties. In case of pulp and paper industry, various SS grades are selected for the wide range of corrosion conditions encountered in this industry. Paper mill head boxes are typically fabricated from austenitic SS plate with superior surface finish and are sometimes electro polished to prevent scaling, which may affect pulp flow. In case of transportation industry, SS steels are used in a wide range of components in transportation that are both functional and decorative. Bright automobile parts, such as trim, fasteners, wheel covers, mirror mounts, and windshield wiper arms, have generally been fabricated from SS grades. SS also serve many non-decorative functions in automotive design. In railroad cars, external and structural SS steels provide durability, low cost maintenance, and superior safety through crashworthiness. The fire resistance of SS is a significant safety advantage. In case of architectural applications several grades of SS are being used. In bold exposure these grades provide generally satisfactory corrosion resistance.